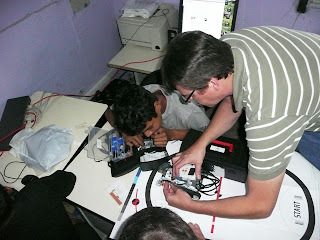 Costa Rican Ramblings: Robotics Ministry? Last week, Henry had the opportunity to visit a ministry in a poor neighborhood of San José called La Carpio. (You can read more about the ministry in La Carpio at www.lacarpio.com) One of the things that this particular ministry does is run a computer lab where neighborhood kids can learn about computers, programming, etc. each week from a friend of Henry's. Previously, the kids had learned how to put one of the robots (Lego Mindstorm) together and this week, they were going beyond the basics of remote controlling it to programming it perform a specific task or two. In the video below, you can see how the project turned out as the robot is (pretty much) following the black line using the color sensor attached to the front of the robot. Later in the day, they learn how to make it shoot little colored balls (you can see the shooter on the front of the robot) when it came across a specific color (red). It was a great time of learning and fun for everyone.